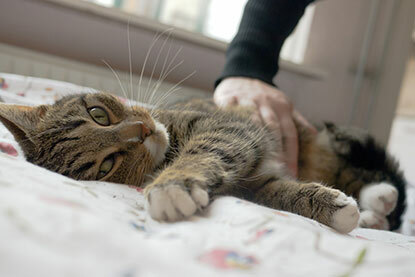 In this week’s behaviour focus post, Cats Protection Behaviour Manager Nicky Trevorrow discusses why a cat may wake and disturb you through the night. Why does my cat keep waking me up in the night? Most cat owners are familiar with their cat trying to wake them up in the early hours of the morning and while the stories may vary, they are often along the same lines. Some cats will miaow at their owners, others will paw at their face and some even knock ornaments off the side. The Simon’s Cat video called Cat Man Do captures this perfectly! The cats are often trying to get us out of bed as they want something, from food or being let outside to attention. We think that the cats are training us, but when you really look at it, what do we all do? We get up at 5.30am to feed the cat or give them a fuss! Without realising it, most of us are reinforcing our cat’s behaviour. As it’s a successful tactic, we have trained the cat that this works so they will try it again in another 24 hours’ time! It’s very hard but the trick is to ignore their behaviour and feign sleep with the aid of ear plugs. Be warned that some cats may try alternative and more demanding ways to try and wake you! If you look at the behaviour of cats in the wild, the African wildcat, which shares ancestry with our pet cat, is generally crepuscular – meaning that it is most active during dawn and dusk. This explains why our cats are naturally more active during this time. Of course, over time cats have adapted slightly to fit in with our waking patterns, but most will be easily woken by the light at the first signs of dawn. It is no coincidence that many prey species are also nocturnal or crepuscular. So what can you do about it? Well the first thing to do is to rule out medical reasons. There are a variety of different medical conditions that can cause cats to wake up in the night, and sometimes to cry excessively, feel restless or disorientated. This is one of the reasons why is important to not tell your cat off when they are waking you up at night as they could be trying to tell you that they are unwell. If there are no underlying medical causes, then finding out your cat’s motivation to wake up in the night can help. Ignoring the behaviour isn’t enough; we need to provide them with a suitable outlet for their behaviour. If the cat is waking you to be fed, then splitting your cat’s daily amount of food into several small meals throughout the day and another before bed can help to keep their blood sugar levels more stable and stave off hunger. Some cats may benefit from having an automatic cat feeder to open during the night or early morning. 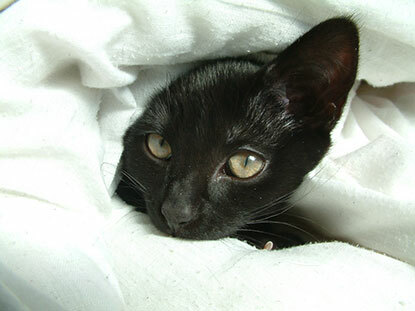 By introducing your cat to feeding enrichment, you can also keep them occupied and prevent being woken due to boredom. Feeding enrichment is providing food to cats in fun and interesting ways, rather than in a food bowl. It requires a bit more thought and is therefore mentally stimulating. Always start with something simple for them to get the hang of it such as a cardboard egg box with a few dry biscuits in. For all feeding enrichment, it’s worth showing the cat how to use it to help prevent them from getting frustrated. You could try hiding a few dry biscuits round the house for your cat to hunt out at night with their fantastic sense of smell and their sensitive whiskers. There are also cat toys available specifically for night time that glow in the dark, such as small, soft cat balls for them to bat. Provide your cat with several play sessions throughout the day to use up their excess energy so they may be more sleepy come nightfall. Interactive toys such as fishing rod toys with feathers on the end are irresistible to most cats. Ensure these are stored away once the play session is over for health and safety reasons. If you are struggling with getting some decent sleep, then you may wish to get a referral from your vet to a qualified behaviourist to identify the particular underlying reason for your cat’s night time activity. We recommend a member of the Association of Pet Behaviour Counsellors (www.apbc.org.uk) for further help. My cat loves going out at night,if the weather is good he will be out from 2100 to 0730 the next morning then 0800 to 0900 and then back in for a sleep,but if its raining he looks at me as if to say can you turn the rain off and lies looking out the patio door until it ease's off then makes a run for it and he will do that all night if the rain keeps on he goes out for about two hours and comes back about midnight when I'm just dropping off then he starts meowing to be let out and I can hear the rain and ignore him so he will sit on my head and purr and purr and it gets louder like a motorbike on your head,if I ignore that he will try and stick a paw under the covers and jab me with a claw and if that gets ignored he hits my wall mirror and starts it swinging,then I get up but most times I will get up before it gets to that.